Beloved by Canadians, folklore readers, cryptozoologists, and skeptics, the well-known writer and broadcast journalist Pierre Berton, 84, passed away on the afternoon of November 30, 2004, in a Toronto hospital, reportedly of heart failure. Berton had a long and varied career, writing more than 40 books, most of which were nonfiction, with several award-winners among them. His remarkable humor and eccentric take on the world was legendary – as was his trademark bow tie, bushy white sideburns and dramatic cloaks. As the Canadian Press observed, merely a month before his death, Berton appeared on the CBC satire show, Rick Mercer’s Monday Report, offering tips on how to roll a marijuana joint, recommending his book The National Dream as an excellent “rolling surface” and warning about the perils of a loose joint. He said a less-than-firmly rolled spliff could leave unsightly toke burns on one’s bow tie. While recent years had seen Berton called upon to be a keynote speaker at a 2003 skeptics’ gathering honoring the Amazing Randi, his early days sometimes involved his fascination with cryptozoology. His 1956 book, Mysterious North was one of the first to chronicle the wide spectrum of cryptids, from hairy hominoids such as Sasquatch and Windigo (see “Note” below), to lake monsters, across Canada. Berton has even become a footnote in the mysterious tale of a missing piece of cryptid evidence. As Mark A. Hall reports in his new book, Thunderbirds: America’s Living Legends of Giant Birds (Paraview, 2004), the biologist Ivan T. Sanderson is remembered to have appeared on The Pierre Berton Show with a photostat of a huge thunderbird affixed to the side of a barn. The “missing Thunderbird photograph” and Pierre Berton’s name are forever tied together in cryptozoology folklore. Born on July 12, 1920 and raised in the Yukon, Pierre Berton worked in Klondike mining camps during his university years. He spent four years in the army, rising from private to captain/instructor at the Royal Military College in Kingston. He spent his early newspaper career in Vancouver, where at 21 he was the youngest city editor on any Canadian daily. He moved to Toronto in 1947, and at the age of 31 was named managing editor of Maclean’s. In 1957 he became a key member of the CBC’s public affairs flagship program, Close-Up, and a permanent panelist on Front Page Challenge. He joined The Toronto Star as associate editor and columnist in 1958, leaving in 1962 to commence The Pierre Berton Show, which ran until 1973. Since then he has appeared as host and writer on My Country, The Great Debate, Heritage Theatre, and The Secret of My Success. 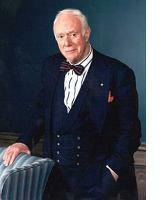 For his massive contribution to Canadian literature and history, Berton was awarded more than a dozen honorary degrees. He was awarded a Doctorate of Athabasca University in 1982 in recognition of his eminence as an historian, writer, and commentator, and of his concern for, and dedication to, Canada. He has received over 30 literary awards such as the Governor-General¹s Award for Creative Non-Fiction (three times), the Stephen Leacock Medal of Humour, and the Gabrielle Leger National Heritage Award. He served as the Chancellor of Yukon College. One of Berton’s final public appearances was in October, 2004, when he attended the opening of a new $12.6 million resource library named in his honor in Vaughan, Ontario, Canada.